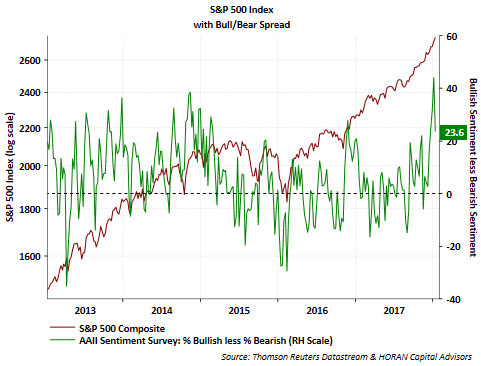 Most of the reported decline in bullish sentiment was reported in the 9.5 percentage point increase in the bearishness reading. The net affect was a decline in the bull/bear spread by 20.6 percentage points to 23.6%. Given the low level of equity market volatility, the uninterrupted climb in the market for nearly two years and elevated investor sentiment readings, one would expect a market pullback. One reason a pullback is not occurring may be due to the simple fact most investors and strategists are expecting one. The market loves proving the consensus wrong. Secondly, as contrarian indicators, the sentiment measures tend to be most predictive of future market returns at market bottoms versus market tops. Nautilus Investment Research recently released some detail via the firm's Twitter site that provides some detail on this difference and one of their charts is included below. 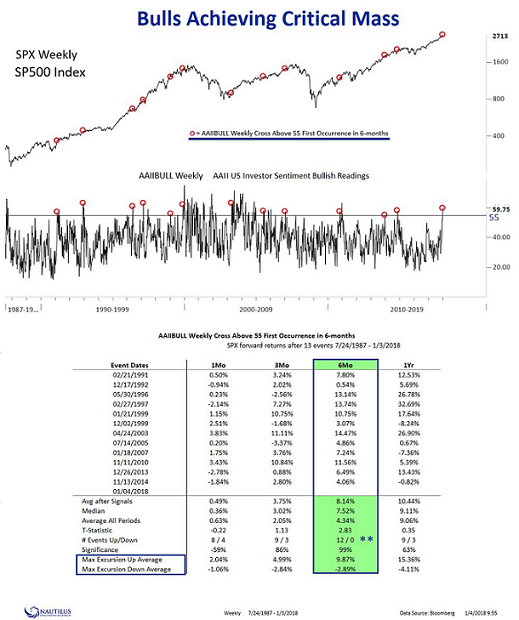 Notable is the fact when the AAII bullish sentiment reading cross above 55 for the first time within six months, which occurred last week, six months later, the market was up 12 out of 12 times with an average return of 8.14%. 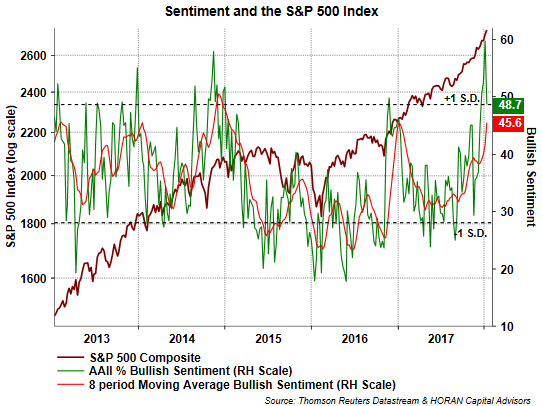 A number of sentiment measures continue to note the elevated bullishness readings. As noted in our recent Investor Letter and prior blog posts, an improving fundamental backdrop, both economically and financially, is serving as a tailwind for companies. A large portion of this improvement seems to be driven by the positive expectations around the recent tax reform legislation passed by Congress. Time will certainly be the weighing machine, but some type of market pullback would be healthy if only to reduce any speculative market froth.